The Schuyler-Hamilton House, also known as the Jabez Campfield House, was built in 1760 on the eastern edge of the small village of Morristown. In 1765, a young doctor, Jabez Campfield, purchased the attractive four-bedroom home. He and his bride, Sarah Ward, lived in the house for fifty-six years, until 1821. Dr. Campfield served as a surgeon during the Revolutionary War. During the winter of 1779-80, Dr. Campfield's house served as the home for Dr. John Cochran, who was assigned to General Washington. Dr. Cochran's wife was the sister of General Philip Schuyler. Mrs. Cochran knew her niece, Elizabeth (Betsy) Schuyler, had met Alexander Hamilton during the summer of 1779, and she had been very impressed by him. When Mrs. Cochran became aware that Alexander Hamilton was stationed at General Washington's headquarters, only a quarter mile away, she invited Elizabeth to spend the winter with her. Very soon, Alex and Betsy began courting, often in the Campfield House. By April they had reached an “understanding.” They married at Betsy's home in Albany, NY, in December, 1780. Dr. Campfield's house was purchased by the Morristown Chapter of NJDAR in 1923; the members decided to name their new chapter house in honor of Betsy Schuyler and Alexander Hamilton. 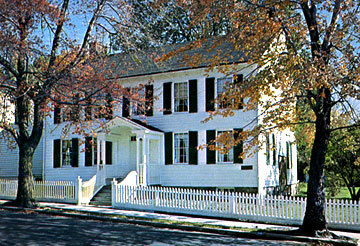 The Schuyler-Hamilton House is located at 5 Olyphant Place, Morristown, NJ 07960. The house is open Sunday afternoons from 2:00– 4:00 p.m. Tours may be arranged. Information is available by calling 973-539-7502.